Last weekend a group of five representatives from a municipality in Jalisco came to visit to learn about our energy systems and gain knowledge of ecological and sustainable practices to implement in their town as they begin to promote sustainable tourism. It was wonderful to host passionate individuals who care deeply about their hometown, Mascota. 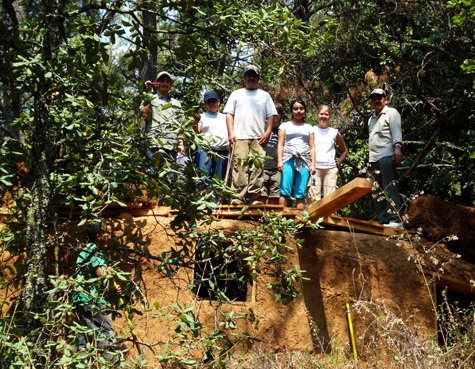 They stayed for four nights and were busy most of the day in meetings that they planned throughout the forest. 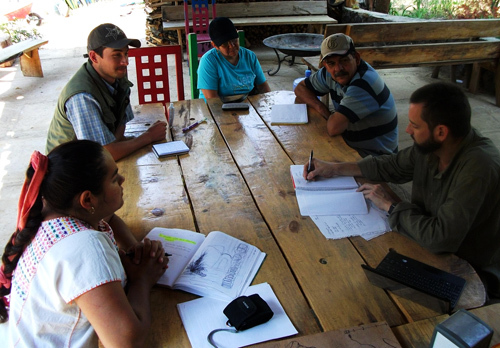 Brian spent several hours with them discussing the forms of sustainable systems at the Bosque and they thought about how to implement these systems into their city-park environments. The municipality is quite close to Puerto Vallerta, and can offer tourists a welcome break from time at the beach due to their fresh aired, mountainous location. During one meeting Brian and the group discussed the planning of two city parks. It was interesting to chat with this group, because a lot of the issues they are working with are similar to the stuff we consider as we plan for visitors and residents living in the forest. We also really appreciated the entire group’s mentality and their desire to improve their town while also thinking about how to save the environment around them and educate people of the benefits of sustainable systems. Their leader, Ixtaccihuatl, is an artist. She painted a really gorgeous piece of art for us. Ixta is a vegetarian and was happy to have a venue to show her friends and colleagues that vegetarian food can be tasty. The four omnivores were unsure that they would be ok with 5 days of vegetarian food, but alas they loved it! Thanks to the Mascota group for being lovely guests. We’ll be pleased to hear about the developments of tourism in the municipality, and we’d be honored to host you again. You are currently browsing the News and thoughts from the Bosque Village weblog archives for May, 2010. Entries (RSS) and Comments (RSS). 18 queries. 0.134 seconds.